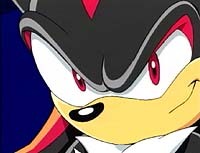 "I'm the ultimate life form"
The above info came from atomofish, and was edited by yours truly (contact me). The image came from shadowamylover. According to Sonic, this black hedgehog looks just like him (though technically, there are some differences). Shadow is an ageless immortal who can wield the power of the chaos emerald to perform the time and space warping "Chaos Control". Shadow has his own agenda and will do all he can to keep to it, making him a very dangerous person focused on his own mission. Maria was Shadow's friend. She made him promise to give the world a chance to be happy, but he could only remember half of her promise and instead tried to take revenge. 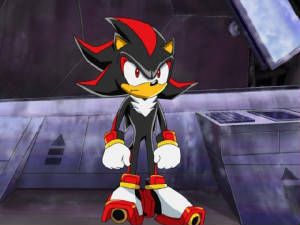 When Amy/Chris (depending on game/tv show) talks to Shadow trying to convince him to help them, he remembers Maria's promise and then goes to the rescue, becoming Super Shadow along with Super Sonic and defeating the Final hazard (correct name for the giant lizard attached to the colony). Maria actually died SAVING Shadow from GUN. Shadow and Maria were best friends- they had plans to go to Earth until GUN showed up. They were trying to escape when a member of GUN found them. Maria shoved Shadow into an escape pod and pulled the lever, just as she was shot. Shadow made it his mission to avenge her death once Eggman woke him up, but ultimately Shadow sacraficed himself to help Sonic stop Eggman. After the events of Space Colony ARK, everyone, including Chris, thought Shadow was dead... that is, until Episode 60: "Shadow has Returned". When he was woken up, thanks to the Chaos emeralds, he couldn't remember anything. However, Eggman promised to give Shadow back his memory. Let's all hope Eggman isn't making a promise he can't deliver! On Sega's Shadow the Hedgehog website, it is stated that Shadow was created by Professor Gerald Robotnik "some 50 years ago". As far as I know, his age in the anime is never stated. The above description came from Sonic X, Travis, Wizard, and Frost the Hedgehog, and was edited by yours truly (contact me). About 50 years ago, a scientist named Gerald Robotnik created a project called Project Shadow. Designed to be immortal and to save the planet, Gerald thought that he was doing a great job. However, the G.U.N. soldiers thought that he'd use this creature to destroy the world. So, during a raid on the Space Colony ARK, the home of Gerald, the soldiers killed everyone in relation to the project, including Gerald and his granddaughter Maria. So, when altering his creation's memories to think that Maria had told Project Shadow to kill all the humans, he put Shadow into suspended animation for 50 years. At the time, Gerald's grandson, Dr. Robotnik (nicknamed "Eggman") had found out that his grandfather had created the Ultimate Life Form, he went to the resting place of Shadow and woke him up. After that, Shadow started impersonating Sonic to get him in trouble. Later on, the two meet and race each other. Shadow was able to match Sonic in speed (though he was wearing Jet Shoes). Their second meeting was at the resting place of Shadow, Prison Island. Here, the to rammed each other countless times, and had another race. Shadow wasn't using his shoes and still matched Sonic! Their third meeting was at the birthplace of the black and red hedgehog--Space Colony ARK. They raced each other again, and rammed each other again, but later on, Shadow worked with Sonic and sacrificed himself to save the planet. He was presumed dead, but six months later, he was reawakened by Rouge the Bat in Dr. Robotnik's base. He now suffers from amnesia and has no memory of events prior to his release. Shadow, aside from strength, color, and white chest hair is an exact replica of Sonic. The above description came from jk, and was edited by yours truly (contact me).